I find these three lines extremely meaningful and deep, hence I decided to get the Jewelmint ring. The set is called From the Heart. To give, to love, to remember- I like how it sounds when I say it in this order. To give is to try your best in everything you do, to love is to spend quality time with the people closest to your heart and to remember is to be grateful and appreciative of what you have. These are pretty good principles (perhaps not the best choice of word as that sounds pretty harsh and imposing, but you get the drift) to live by. I like to wear the rings on the same finger and stack them, with one near my knuckle. The other alternative is to wear it on a chain. I made a simple black chain necklace and strung the rings through it. Looks pretty funky, and a good piece to do layering! 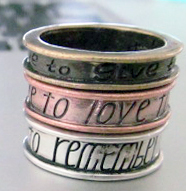 A nice reminder of what life is and what it should be when I look at these rings.